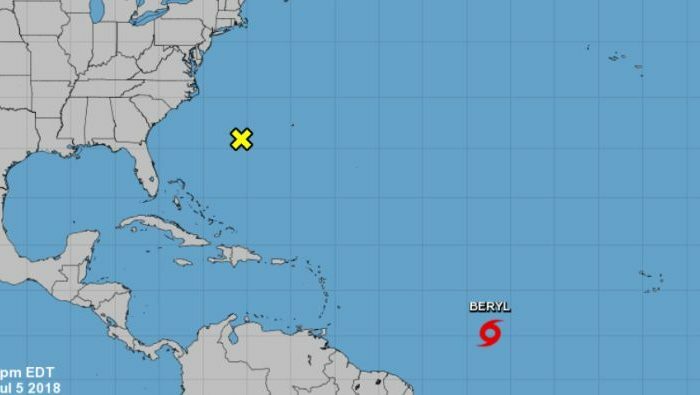 The U.S. National Hurricane Center on Thursday began issuing advisories for Tropical Storm Beryl. The storm, according to the agency, is located about 1,385 miles east-southeast of the Lesser Antilles islands in the eastern Caribbean Sea. It has winds of 35 miles per hour and is moving west at 16 miles per hour. For now, the storm isn’t posing any hazards to any countries or territories. “The system is forecast to degenerate into an open trough east of the Lesser Antilles over the weekend,” the National Hurricane Center (NHC) said at 5 p.m. ET. “Beryl is currently in a zone of sufficiently warm water and relatively low wind shear for some further development,” said AccuWeather meteorologist Brett Rathbun. “Strong wind shear, dry air, and dust are likely to cause the feature to weaken and may result in a total demise of Beryl,” added AccuWeather’s Paul Walker. “It is because of these conditions that AccuWeather meteorologists do not expect Beryl to become a powerful hurricane,” Walker said. Forecasters noted that remnants of the storm could bring heavy rains and winds in portions of the U.S. Virgin Islands, and Puerto Rico. Beryl is the second tropical depression of the 2018 Atlantic hurricane season. Subtropical Storm Alberto became the first named storm of the season when it formed in May, dumping heavy rain on the southern United States. Also in the Atlantic, a tropical disturbance east of the U.S. East Coast is also being monitored by the NHC.